It was Thursday at 2:00 and Mrs. Edmonds realized that in fifteen minutes Mr. Berger's third grade class was due to begin music class. She dreaded teaching Mr. Berger's class because of one student: Jason Hendricks. Jason was diagnosed with ADHD when he was six years old. He is now 8. As he has gotten older, Jason has had more difficulty participating in group singing games because he can't seem to sit in one place for more than 30 seconds. He disrupts all cooperative learning activities by pulling other students' hair, jumping up and down, waving his hands and head, among other things. While he has never threatened or hit other students, his behavior is just disruptive enough to misdirect the other students' attention to the task at hand. It seemed to Mrs. Edmonds that every time the class activity was going well Jason would begin to act out and the students would dissolve into peals of laughter. Mrs. Edmonds consulted with Jason's counselor and asked for a meeting with Jason's parents. She learned that Jason was doing well in class but would often not be able to control his behavior or focus on reading assignments. Jason's parents told Mrs. Edmonds that they had worked out a verbal signal ("check yourself") with Jason to let him know when his behavior was beginning to get out of hand. The counselor recommended placing Jason closer to the front of the room nearer to the teacher to enable Mrs. Edmonds to monitor his behavior more closely. Mrs. Edmonds was able to work with the principal to reschedule. Mr. Denny was scheduled to attend Derrick's IEP meeting this morning. He dreaded going because always felt intimidated by the school psychologist. It also seemed to Mr. Denny that the school psychologist was in a hurry to get the meeting finished and did not consider Mr. Denny's requests or questions. Mr. Denny wrote down all of his questions and submitted them to the school psychologist a few days before the next meeting. At the meeting, the school psychologist addressed each of the questions, and Mr. Denny made a point to ask for a clear explanation, especially when the psychologist used acronyms. Mr. Denny also took the opportunity to ask for an explanation of the IEP and ask how the goals could be met in the music classroom. Melany, a fourth grader, has Asperger Syndrome. Her teacher, Mrs. Smith, has noted that Melany reads well, writes some words and phrases using a computer, however, has difficulty talking with her peers. Melany is also able to perform some American Sign Language gestures. Often when asked a question, Melany does not look directly at Mrs. Smith or the other children and appears to be focused on other subjects. She does not look anyone directly In the eyes, however, as she has become more familiar with her classmates, Melany is able to communicate through a combination of words, gestures, and symbols. In her core subjects, Melany's ability to successfully work at grade-level is dependent upon the requirements of the subject matter. The Child Study Team recommended curricular adaptations that have increased Melany's ability to complete assignments. Her curricular adaptations involve a combination of simplified objectives in math and language arts as well as altered, functional objectives in the areas of school routines, self-help, and communication. Therefore, at some times during the day, Melany works on the same objectives as her classmates, except at a different level. For instance, when her classmates are using the writing process to write a brief book report on the computer, she fulfills this assignment by completing a form developed by the special education teacher. While Melany feels comfortable with Mrs. Smith and her classmates, she often over reacts negatively to certain sounds that no one else seems to hear and she interrupts conversations and appears rude. Mrs. Smith has helped her to focus on the communication, social, and self-management skills that will enable her to function more independently in her school and community. For example, if the group work continues for longer than Melany is able to effectively participate, she is given permission to use the computer to write a note about her school day for her take-home journal. Melany sometimes becomes frustrated in class and will act out by screaming or crying. She has difficulty relating with peers and is unable to choose a group, or find a group easily. The Child Study Team has recommended that Melany take several preventative movement "breaks" to relieve her stress and that she use the provided opportunities to use self-calming strategies when necessary to lower her frustration level and to help stay focused. In music class, Melany is accompanied by an aide who sits with her. Since she is very limited in communication skills and cannot sing songs with the group, the music teacher assigns Melany to play simple percussion instruments, but is unsure as to how she can more fully integrate Melany into the music activities. provide sign language for songs. provide ostinato accompaniments to songs sung by the class. It would be good for her to be able to role play or have a simulation of what the music lesson was going to involve before class. As a part of her difference, Melany is a good "rule follower". She will want to know what the academic as well as behavioral rules are. She may enjoy learning about lines and spaces and their names because they are rules and they never change. Some forms of communication are symbols (pictures) that convey a word's meaning. A chart of symbols or pictures can display what is expected of her, for example, pictures of her displaying good behaviors in music. Students with Aspergers Syndrome sometimes obsess about things that are of high interest to her. Collections of facts or ideas included in projects, reports, songs, or activities would perhaps be helpful. Repetitive motions (like the ostinato) are good for helping her contribute to the music class and practice self-calming while allowing her to focus on an enjoyable activity. Melany may need to be assigned to groups and have peer groups built for her during class. She also needs to be provided with frequent movement breaks as she and/or the aide feels necessary. These breaks are for her to practice self-calming strategies. Lena had been teaching high school band for 15 years. Her band consistently earned Superior Ratings at festivals and competitions and was widely considered one of the best bands in the Central Tennessee Valley. Lena's school system had undergone some changes in the past five years as more special education students were coming to her high school (Redbird High School) for vocational and academic studies. The number of special education faculty had increased significantly and Lena was having difficulty explaining to the special educators that her band was not the place for students with moderate disabilities. Shawn was placed in Lena's Concert Band at the beginning of the spring semester. Lena was informed of his arrival the day before school began and he came to class with a trumpet, band book, and paraprofessional. Lena had never worked with a paraprofessional before and really saw the inclusion of the student, and another adult as a major intrusion in her already busy life. Shawn had played trumpet in another band program and seemed prepared to play; however, he missed all his cues, dropped the music off the stand twice, and laughed very loudly at other students' mistakes. The paraprofessional sat in the back of the room and watched class. Lena was incensed and immediately called a Case Study meeting. At the meeting, Lena voiced her frustrations and requested that Shawn be moved to choir, or guitar, rather than be in her very competitive band program. 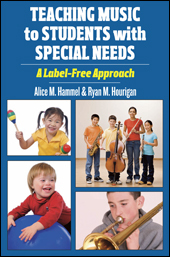 Her request was refused and as the discussion progressed, she slowly realized that it was perhaps unfair of her to insist that special education students take choir or guitar rather than band. The paraprofessional stayed after the meeting to talk with Lena. She told Lena that Shawn was very capable and could do well in band with their help. Lena and Annie (the paraprofessional), began to work on a plan together. Annie did not read music yet was willing to learn. Lena taught Annie the basics of music reading, gave her the band handbook to get an idea of the program expectations, and the two agreed to meet once a week to discuss Shawn and plan ways to help him succeed. Annie began sitting next to Shawn in class and slowly moved her chair away from him as he became more independent. Annie was able to assist Shawn in marking his parts, counting rests, and they brought a heavier and sturdier music stand that was not easily toppled over. She also began to assist other students occasionally and was able to identify behavioral and academic issues in several students who sat near the back of the band room. By the end of the year, Lena and Annie were looking forward to working together as another two students would be included in the band program the following school year. Jamal was a first year teacher at Hull Elementary School. He had worked hard to learn all the school procedures, set up his classroom for the success of all students, and was aware of all students with special needs. He thought he was prepared for anything. The third week of school, Amaya's parents called to set up a meeting with him. Jamal thought this was strange as he had only seen Amaya a couple of times and she had done well in class. He knew Amaya had difficulty with transitions and was sometimes unable to participate in class because of mobility issues (Amaya uses a wheelchair). When Jamal arrived at the meeting, he saw both of Amaya's parents, the Principal, and an advocate with a degree in special education law. The parents and advocate were very vocal in their opposition to Amaya being "excluded" from activities because of her disability and demanded that she receive a special music class each week and that her inclusion music class be made 100% accessible to her. Jamal didn't say much in the meeting because he was completely intimidated by the parents and advocate. The Principal did not really seem to be in his corner either. Jamal went home after the meeting to think about how to proceed. Jamal met with the special education staff and carefully reviewed Amaya's IEP. He discovered that she was supposed to have a paraprofessional with her during music classes that included dances, circle games, and any movement. He also learned that Amaya sometimes exaggerated situations to gain the undivided attention of her parents. The special education staff agreed to work with Jamal and to have someone present when his lesson plans indicated a need. The special education staff also talked with Jamal about an important Supreme Court Case (Rowley) that highlighted the difference between an "ultimate" experience in school and an experience that was made free, appropriate, and of equal opportunity to everyone. The special education staff and Principal (who was just having a bad day the day of the meeting) agreed to discuss this with the parents and the advocate who was probably aware of the court case as well. Sam is 14 years old and a ninth grader at his local high school. He is a highly articulate young man who has characteristics of pervasive developmental disorder and obsessive-compulsive disorder. Sam has a wide range of academic skills; his vocabulary skills, reading comprehension, and general knowledge are his strengths, whereas he finds math and other skill areas that require close attention and decision making to be more challenging. Sam's schedule includes general-level academic courses and electives that allow him to explore vocational options. He receives full-time special education instruction and support from a special education teacher or assistant and one period per day of direct instruction in a resource setting. Curriculum adaptations for Sam involve simplifying the content by eliminating technical, conceptually difficult, or confusing material. Because of his curricular modifications, Sam will be a candidate for an IEP diploma rather than an academic diploma. Sam is in the 7th grade band at Belle Valley Middle School. He is a percussionist. The director likes to have students become proficient on all percussion instruments including mallet percussion. Sam chose snare drum because he liked the rat-a-tat sound and his dad played snare drum in his college marching band. Sam takes snare drum lessons from a symphony member. He also likes to tape Drum and Bugle Corps competitions from TV and watches them in an obsessive manner. Sam's primary goal in music is to become a snare drummer in the high school marching band, which is award winning and nationally known. The high school director has been at Valley High School for 20 years and is not a fan of inclusion. Sam is an outstanding snare drummer and the high school director would like to have him included in the band if he can increase his ability to interact in age appropriate ways. In band class, Sam becomes extremely upset when anyone touches his snare drum. He insists on transporting his drum every day from school to home. Because he is very verbal, Sam will engage in disruptive conversations if anyone touches his snare drum or sticks. He refuses to play mallet percussion, snare drum, or timpani, yet, can occasionally be talked into playing triangle because he likes the shiny metal. Sam's private teacher works with him on rudiments and stick technique, however, Sam does not perform well on music theory exams. He does well on listening exams. Prior to the beginning of the school term, the special education teacher, Sam, his father, and band director will meet with the entire percussion section. The students will be introduced to Sam and will be given a better understanding of Sam and his differences. Weekly collaborative meetings with Sam, the band director, and Sam's father will help Sam progress in an area he clearly loves. The private teacher is unable to attend the meetings, but is willing to send a weekly notification as to progress and behavior with Sam's father. The focus of these meetings will be to monitor Sam's progress toward more age appropriate social skills within the band setting. Audio tapes should be prepared for each selection of music. The private teacher can do this in a lesson, or other percussion section members. His snare drum should be placed at the outside of the section to reduce the possibility of disruption (not isolation - just preferential positioning). Frustration can be alleviated through the opportunity to leave the classroom with a prearranged activity (taking a note or a paper to the special education teacher that has already been written by the director). The director can ask Sam to take the item, and then he can leave the room. The academic requirements for Sam will need to be modified according to the IEP summaries (present level of performance). Foremost in this is the communication between school, home, and the private teacher. This could be the class that "saves" Sam. Susan is in an auditioned 9th grade concert chorus. This is her first year in chorus after an unsuccessful attempt at violin. She auditioned for the group at the end of 8th grade. The audition piece was the "Star-Spangled Banner." The director was very impressed with her voice and immediately accepted her into her first soprano section with no knowledge of her reading disability. Susan reads at the 2nd grade level. She has an excellent sense of pitch and a lovely singing voice. She is very motivated to learn and loves chorus. Susan sings in church choir where her director teaches primarily by rote. Susan is extremely popular with her peers. Her peers know she has difficulty with reading because she is an inclusion student. Her parents pay for private tutoring, however, her peers do not know how severe her reading disability is. The first week of school, things go remarkably well for Susan in chorus. They are practicing for the first assembly where they will sing the school song, the "Star-Spangled Banner," and an easy arrangement of "This Land Is Your Land." Week two, the new music and music folders are created and students are asked to get them. The folders are full of new music and are filed according to last name. Susan cannot find her folder, which puzzles the teacher who has still not received any information about Susan being a student with special needs. By the end of that rehearsal, the choral director has made a note to see the guidance counselor at her lunch break because she knows Susan may need some assistance. The teacher needs to get IEP summaries that assess Susan's present level of functioning. She also needs to meet with the special education teacher and Susan's parents to get a better idea of her abilities, disabilities, and some direction as to how to accommodate Susan in choir. 1. Making an audio tape of the music - preferably before the music is first introduced in class. It would be best if this just included the soprano line. Later, it may be helpful to include all parts on the tape. 2. Adapting music theory work according to her IEP needs. 3. Allowing her to use a highlighter (erasable) on her music so that she can more easily see her vocal line. During study hall, perhaps Susan can practice her tapes. Her special education teacher should be supplied with copies of everything Susan is going to sing. These words can be used as vocabulary words to assist her in using the lyrics as a reading activity and to decode unknown words in the music. Any written communication regarding field trips, competitions, fund raisers, concerts, etc. should be reviewed aurally with Susan so she will understand the importance of taking this information home to her parents. * Low Self-Esteem-Many patients with ADHD may suffer from low self-esteem as a result of the disorder's symptoms. Nicole Crawford, author of the article "ADHD: A Women's Issue," points out that when women do not get their ADHD treated, they suffer from chronic low self-esteem. The low self-esteem can stem from problems in school, which can occur with all of the symptoms of ADHD. For example, with the inattention symptoms, the MayoClinic.com notes that patients have problems finishing work, make careless mistakes and are easily distracted. They may also have organizational problems and dislike schoolwork. With the impulsive and hyperactive symptoms, patients have problems staying still during class and may interrupt others. The problems in school can lead to failure in school, which may cause underachievement in patients. The underachievement can add to patients' low self-esteem.